Britain's architecture is full of great history and quite a few old buildings; many of which have been around for centuries. If you have interest in old architecture and historical landmarks, some of Britain's oldest buildings are detailed below. 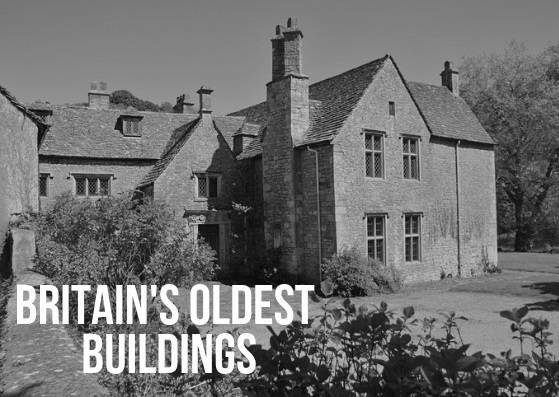 Located near Bath, this is the oldest home in Britain that has been continuously occupied. Some features of the home, like the ornate windows, date back to 1148. This is also around the time that the Hereford Cathedral was completed. The house used to have just one massive room on each of its floors, however, it was remodeled back in the 17th century. Historians state that the most historically notable features of the house that have survived until today are a fragment of a painting from medieval times, the main bedroom's Norman window, the kitchen that is intact from the 17th century renovation, and the sitting room's Tudor fireplace. Built back in the 1130s, this home is iconic to Cambridgeshire. It has been continuously occupied for more than 900 years and is often claimed to be the oldest inhabited house in Britain (albeit with much dispute). The house is first thought to have been occupied by Payn Osmundson. He was thought to be a tenant of the very wealthy de Vere family. William the Conqueror gave them large grants for the land it was built upon. The house looks much different today from when it was originally built, due to its modernization that took place back in the 18th century. The house is currently owned by Diana Boston, who has helped sustain the ecclesiastical-style of the building. It's thought that Fyfield Hall was constructed as early as the late 1160s. If this is correct, this would make it Britain's earliest known inhabited domestic structure with a timber frame. The entrance hall also has an oak post that was carbon dated to be anywhere between about AD 880 to 985. Although was remodeled around 1400, the building was given an archaic style that was popular in the 1100s, one that remains in-tact today. An incredibly interesting aspect of the hall's history involved Henry V's possession of the manor in 1415: before claiming ownership of said land, he beheaded the third Lord Scrope, who was then buried, headless, in the churchyard. For the most part, this property has been continuously owned by the same family, with the exception of a small amount of time when the Tudors owned it. Construction of Berkeley Castle finished in 1067, but the oldest parts of the castle that have survived over the years date back to around the 1150s. However, most of the castle that's still standing today dates back to the 14th century. This castle has quite an interesting history as King Edward II was both imprisoned and murdered here: his cell and site of his murder are still visible today. With incredibly early Renaissance decorations, the building still contains a Norman Hall dating back to approximately 1160. Horton Court was built around it and the hallways of its main house are supposed to date back to around 1482.